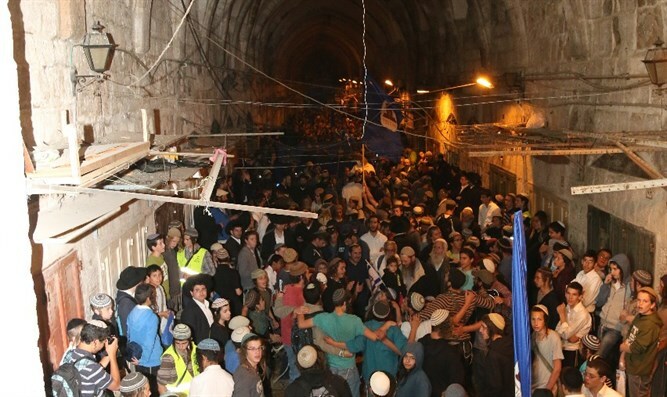 The traditional monthly circuit of the Temple Mount gates took place Tuesday night in honor of the new month of Iyar. More than a thousand marchers participated Tuesday night in the monthly tradition of going round the gates of the Temple Mount in honor of the new Hebrew month of Iyar. The participants left from the Western Wall and circled the gates from the outside while praying and dancing. Due to the custom of mourning during the period of counting of the Omer, no music was played during the event. At every gate of Temple Mount psalms were recited and at the Tribes Gate near Lions Gate the participants counted the Omer. Rabbi Yosef Palay from the El Har Hamor association which organizes the circling of the gates said that the month of Iyyar is the month in which Solomon completed the building of the First Temple. "It is also the time when the Second Temple construction commenced and fifty years ago the Temple Mount was freed for the third time. We hope and pray that the Third Temple will be built in Iyar"
Due to the Musiim month of Ramadan, the monthly circuit will not take place for the next two months and will continue only in the month of Av.